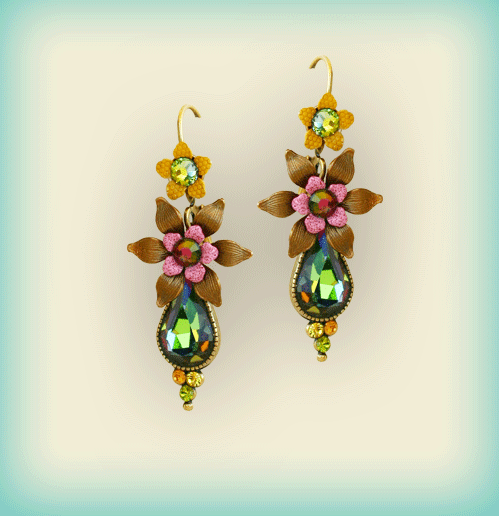 Description: The set of earrings is reminiscent of lanterns and nightingales with their brilliant light and splendor on a dark night. The center flower has sharp and prominent petals which have a beautiful texture and hue to them. The flower is topped with another smaller flower and a stone center. 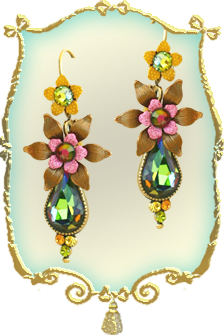 A dazzling tear drop crystal is fitted at the bottom in a small delicate metal frame. A trio of small round stones sits at the bottom of the tear drop crystal. The open ended hoop makes it easier to wear and remove and is a delight to the wearer.